Oh My Bows! I officially have the best readers! 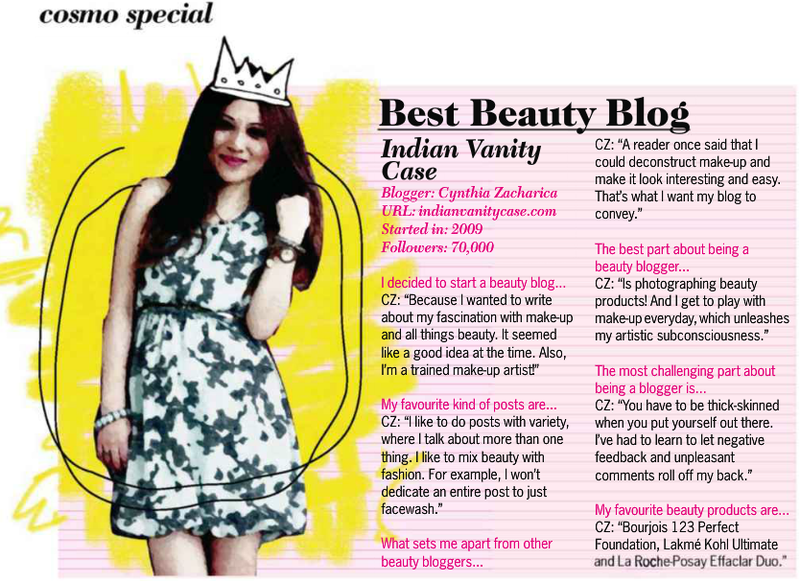 We won the award for Best Beauty Blog (India)! YOU VOTE PHOR MY BLOG! Thank You! 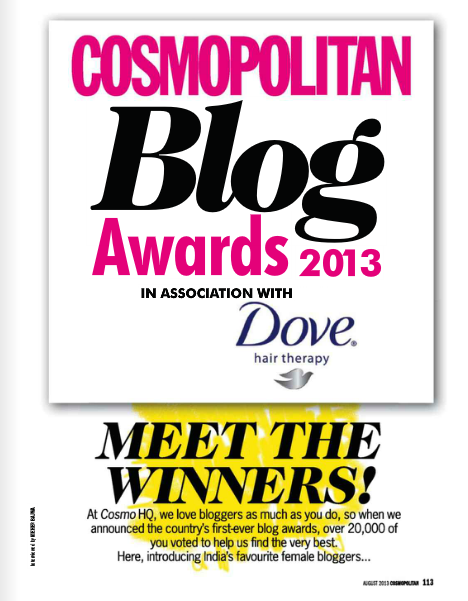 THANK YOU SO MUCH to everyone who voted & everyone who simply reads this blog! Special thanks to Cosmopolitan India for hosting India's first-ever blog awards! There's a cartoon-ish version of me. Give me a jharoo (broomstick) so I can fly... haha! Cosmo has also launched The Cosmo Beauty Panel, consisting of 17 people who'll help them test new beauty products every month, and it's an honor to be one of them. *Please leave out questions about blogging for now, because I will do another post for that, and I'll answer all FAQ's. OMG I am soooo glad you won :) CONGRATULATIONS Cynthia!!! You rock and you totally deserve to win!!! :D Gosh I love your blog!!! this is just wow CZ....Lots n lots of love n wishes to you....Keep up your fabulous n beautiful work...!! Congratulations - a very well-deserved win! I've been a regular lurker on your blog from 2009; every time I have a moment at work, here I come, and no one in my office has been any wiser :P In fact you even inspired me to start blogging about beauty. And we share a love for Bourjois - one of my all-time favourite blog posts ever was when you shared a picture of a gorgeous black-and-pink umbrella you got off Bourjois as a GWP, and I marched over to my Bourjois counter and demanded why I was being given all these bright pink pouches when brollies were given in Delhi! I won't say this is because of luck. It's all due to your hard work. I adore your blog. Your writing style, pictures everything. Congrats CZ.. I just love your blog.. The way you explain your little stories behind everything you buy.. I loved it totally.. You deserve this award..
Omigosh! congrats mo phi! :D rooted for you all the way.You're way better than the rest! Aww khublei shibun Kindy :) Thank you loads! Congratulations CZ! U deserve this for sure. I love reading your blog. 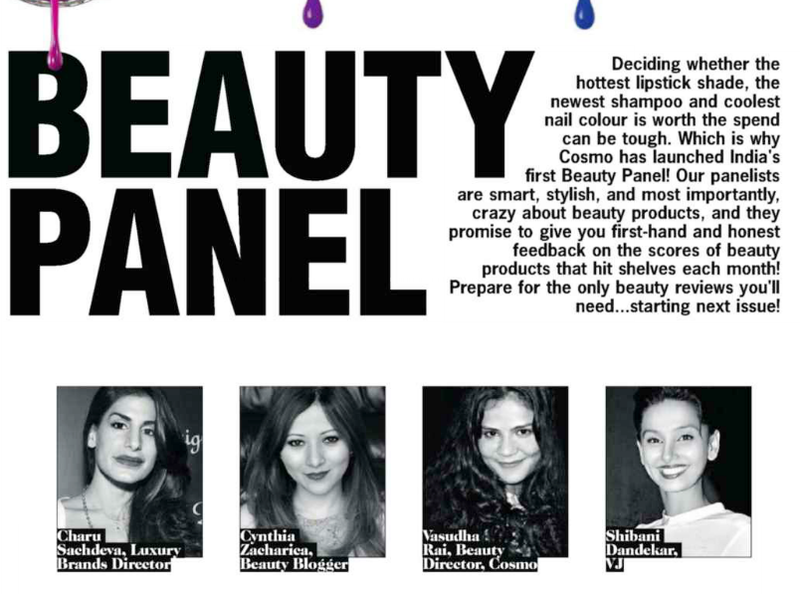 Keep up the good work and keep us all inspired with good makeup and beauty. All the best. So sweet..Thank you so much Avanti! Congrats CZ!! I am so glad u won! :) I had voted for you and hoping that u win.. I am feeling so happy as if I have won it! :P crazy isn't it... :D So happy for u.. u deserved it! I had voted for u & I kinda knew you'd win! omg that's so awesome!! of course I knew you'd win this ;)I love all your posts and your sense of humour!! way to go girl...CONGRATS!!! congratulations Cynthia. Your hard work has fetched the prize for you. You totally deserved it. Being a reader of your blog is like having a calm ride on a boat in a lake. You have the flow within yourself. Voting you was not an option, it was a duty for me as a reader. I'm glad you won. Aww.. Congo girl. I voted for you and so glad you won the well deserved title. I only cast one vote amongst all the blogs in all categories and that was for IVC! Hi Cynthia, congrats! I voted for you and I can't think of a more deserving person. 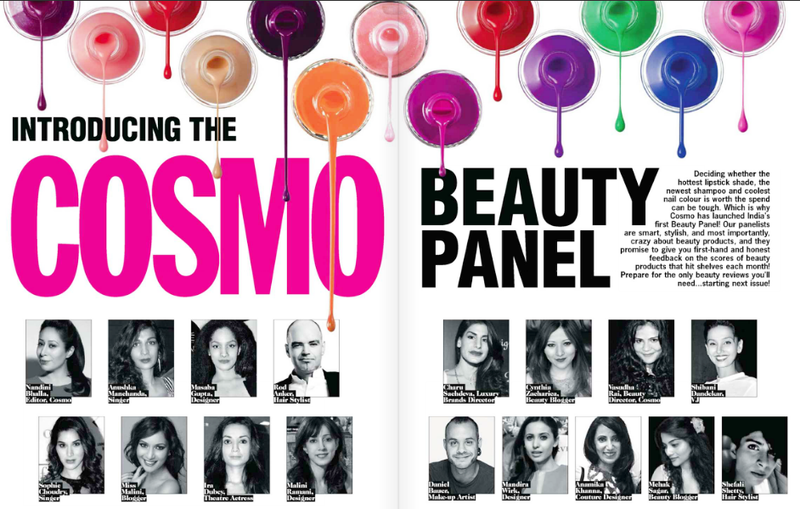 The best part about being a member of the cosmo panel is that you will get freebies(i guess.. hahaha). I love your lotds, especially the one in which you wore coral(lips and dress). Your hair looked so awesome in that, can you show us how to do an ombre like that please??? Congratulations Cynthia! Its inspiring to know that even you got negative comments that you ignored to move on! I hear it all the time that 'beauty' blogging is a waste of my time but now I know for sure that patience and hard work do pay off! Love to read your posts and yes, the photographs are amazing! Congratulations Cynthia! I found your blog about a year ago while searching for a cat eye tutorial and have come back ever since! You are such a dedicated blogger, you take beautiful photos, and I love your sense of humor. Thank you for the amazing work you put into this site, the inspiration you provide for amateur makeup addicts like me, and for being such a sweet person! Love you! Aww thanks Sruthi..very sweet of you to say..glad u came back! Love you too! CZ you deserve it.. Congratulations. Its treat to see your eye-makeup, OOT, shopping, product reviews and tutorials. IVC has all. Wish you lots of success in future too. Thanks Shikha! Wishing you lots of success to you too! Super cool! :) Thanks for voting & for the love! I am so so so happpppy for you! I mean this is so well deserved! <3 You go woman, continue rocking like this! \m/ *air fists* many many congratulations, beautiful! <3 Not to sound cheesy, but ILY! <3 SOOO MUUUCCHH!! am so happy that u won.. u truly deserve that.. I love ur blog and been following each ne very post of urs.. though i have never commented, i like silent reader and follower.. U Rocks..!!!!!!!!!!! I have been following IVC ever since I found it 2 years back, sometimes I'm a silent reader but I make sure I don't miss anything here. I feel very connected and personal to this blog, its an integral part of my life now. I remember your words Bhawna :) That's one of the best comments! Happy to be part of your life! Thanks a million! Congratulations CZ...You deserve every bit of it :) Keep Rocking! Congratulations Cynthia:) m sooo happy that u won actually we all won bcoz its our blog too:) actually u wil not belive my internal intiution was saying that u wil win! U deserve again heartiest congrates!! Congrats! Very well deserved indeed.. But I understand n would love to see your reply more often .. congrats!!! u deserve it and i love u and your blog!!! Congrats, Cynthia! Great news. I voted for you :-) I love that your posts are not boring (like you said- one post for face wash! snooze!). And you also add your personal little stories which makes you so much more relatable. Lots of love. Keep up the good work. P.S.- Your pics are simply the best among Indian Bloggers! Congratulations and very well deserved!! You're such an inspiration to new bloggers like myself, so thank you for everything! Congratulations, girl. Keep up the good work! Everytime you do a post on shoes and clothing I get so effing jealous about the stuff that you can get in the UK for so cheap.. and of course makeup as well, in India they cost nearly double.. I guess the highlight of your win would be the fact that despite you not requesting your readers to vote, they still did. :) Shows how much we all love you. <3 Congratulations once again! Lovely comment Ashwini! Thanks so much! I understand what you mean about the shoes there, I also wish fab ones were priced lesser. That's very sweet Neeraj! Thank you! Thank you, thank you...love you too! You totally deserve it Cynthia. Your blog is truly of the highest standards! So, Our Votes Didn't Go In Vain!! I Actually Ran n Got a Copy From My Stationary Shop..Much Better To See You In Real Page! You Are an Inspiration For Many Bloggers, Including Me! They made it happen! :) Thank you soooo much Heena...and all the best with your own blog! I found your blog thru the cosmo awards, but as soon as I clicked around a bit, I realised this was the real deal - and voted for you! As well as peaches and blush, I like that one too. So well deserved Cynthia!!! You truly are talented.And the reason i am addicted to your blog (apart from the bestest swatches that u do) is the passion and honesty with which you do things around here.Its such a breather compared to a few others.Big congratulations! !keep rockin girl!! That's very sweet and thoughtful Anupam. So happy to have readers like you, who see beyond the "presentation". Thank you so much! You're like my role model CZ :) Wish I can win something like this one day. I had been thinking about blogging about beauty products for so long and then you and your blog finally gave me the inspiration I needed! Thank you. And you will Tanaya :) Just put your heart into it, and everything good will come to you. Congrats on your blog! Almost 3 years later, I'm revising this blog post .... and see my name in there! I've learnt so much from IVC ... and it's wonderful to watch the blog grow. Cheers, Cynthia!